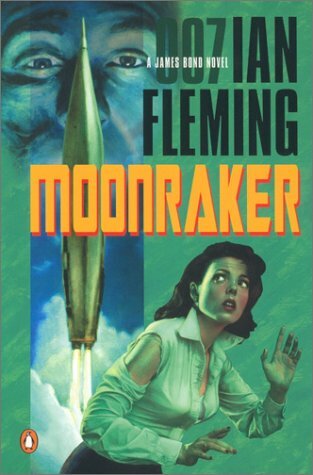 Moonraker is 007’s third adventure, and the stakes have never been higher. It’s one of Fleming’s most timely novels, playing on the rampant fears of the 1950s, of rocket attacks from overseas, and seemingly inevitable nuclear warfare. It is a clear demonstration of Fleming fine-tuning his craft, ably mixing the perfect ingredients – high stakes gambling, a thrilling car chase, and a megalomaniac villain – to concoct one of James Bond’s best, and most thrilling, escapades. The novel starts slowly, offering rare introspection and analysis of James Bond: his lifestyle and habits, and his monotonous routine (contrary to what readers might’ve expected, given his exploits in Casino Royale and Live and Let Die). Bond acknowledges his unknowable expiration date – spies are expected to be killed on the job, after all – and explains why he’d rather spend his money than save it for a future that, in all likelihood, will not come to pass. As the novel begins, he is the only agent in the Double-O section marooned to headquarters, and is tired of the compulsory reading and paperwork heaped upon his desk; relenting the nature of his work, and the reality that ‘big cases’ only land on his desk a few times a year (probably a good thing, or Fleming’s rendition of Britain surely would’ve suffered an apocalyptic demise at the hands of its enemies). Of course, fate has other plans, when M buzzes Bond into his office. There’s that familiar spike of adrenaline before a big case, but as their conversation begins, it becomes clear this is something very different. Something personal, perhaps. Bond’s first hint is M referring to him as “James.” A distinct rarity. Sir Hugo Drax – yes, that Hugo Drax, the self-made millionaire and public hero, responsible for Britain’s Moonraker rocket – is a regular at M’s evening club, Blades. And quite a lucky gambler too, all things considered: Drax has been winning a lot of money playing bridge. Too much, M things, and suspects Drax of cheating, but has no proof. He hopes to utilize Bond’s natural eye and propensity for high-stakes gambling to confirm, or invalidate his suspicions. There’s too much riding on the success of the Moonraker: the last thing the project needs is to be undermined by its leader’s imprudence. From Bond’s cursory glance into Drax’s illegitimate gambling methods, the plot of Moonraker quickly escalates, with London itself the target of a devastating attack. Ably assisted by Gala Brand from Special Branch – the first ‘Bond Girl’ to truly demonstrate her capabilities and not simply be typecast as a hapless victim, or a mere love interest – the novel propels along at a great place. Fleming pulls of its finale with aplomb, too: it quite literally involves Bond and Brand listening to a BBC radio broadcast, but the author uses all of his verve to maintain the suspense. Readers will be white-knuckled until Moonraker’s final page.